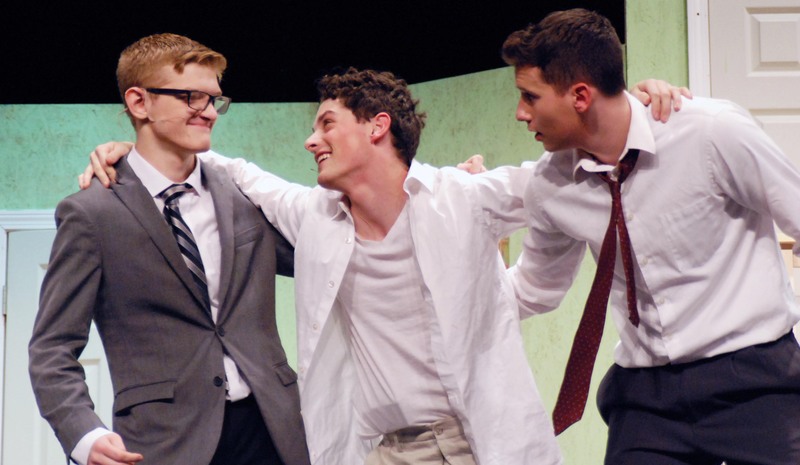 As the curtain falls upon the RHS Theater Guild’s performance of the comedy Moon Over Buffalo, we take a look at the fun memories the cast and crew will never forget. The show which was presented in the RHS auditorium on Dec. 7, 8 and 9 follows an acting company on tour in Buffalo, New York in the year 1953. The company is led by acting couple, George and Charlotte Hay (senior Ronan McNally and junior Megan Diver), their daughter Rosalind (freshman Emily Gaboriault), Rosalind’s fiance Howard (senior Ryan Struzziery), and Paul Singer, Rosalind’s ex-boyfriend, (junior John Ellard).Richard Maynard (senior Ryan Mott) is the Hay’s lawyer, who is in love with Charlotte and wants her to run away with him. Conflict in the story is created by Eileen (senior Erin Field) who is an actor in the company. She had an affair with George and is pregnant. The plot becomes complicated, and hilarious, when George has too much to drink after Charlotte leaves him. More comedy is provided by Charlotte’s mother, Ethel (senior Kellie Berry). She is hard of hearing and hates George. This was Joanne White’s fourth performance as director, her first show being two years ago in December, 2015. She found the cast and crew of this play took direction and character development quite well. The Theater Guild gained several new members this year. For Gaboriault and Ellard, this was their first time acting in a high school play. Senior Madison Parlee has worked on plays since her freshman year. However, this year is the first time she assumed the part of stage manager. Parlee feels that the switch from crew to stage manager allowed her to take charge, and learn to lead instead of follow. Her favorite part of the process, she says, was “showing everyone how hard we worked.” She, along with assistant stage manager Ali Landi, worked ceaselessly to make sure everyone from actors to audience had a good time. The show was well received by the audience who could be heard laughing hysterically at the gags and jokes made by the show’s colorful characters. While the viewers changed each night, it appears the reactions stayed the same, as night after night the play brought laughter from audience members. The audience weren’t the only ones to enjoy the production. The cast and crew had an equal amount of fun working on the play. This is due to directors, Ms. White and Ms. DiCanzio whose enthusiasm, humor, and attention to detail motivated the cast and crew in the production of the play. To see a photo gallery from the play, click here.